Dental implants are replacement teeth for your own teeth that look and feel natural. All implants at Dental Care Hillsborough are placed by one of our certified specialists. The procedure has two steps. The first step is to place the implant. After placement the implant needs time to anchor into the surrounding tissue. This time varies from patient to patient but is typically 3 months. 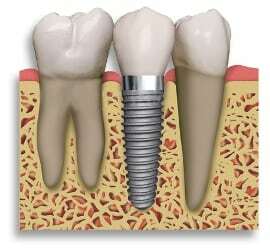 When it is healed, the dental implant is ready for a crown. The crown is matched to the appearance of your other teeth.